In 1998, GoTo pioneered the idea of selling search ads. You could buy search results for as low as a penny or two per click. This system has quickly evolved into one of the world's most competitive marketplaces. Pay-per-click (PPC) search engines can give you instant traffic and allow you to test new business models in real time. However, the pay-per-click market is competitive. It is worth spending an extensive period of time learning how to write and target ads, tracking your competitors, and doing deep keyword research before jumping in. Quickly gather feedback on market conditions. Split test a live audience and gather ad test results in real time. Prototype ideas to track demand before you invest into a new business model or are stuck footing the bill for a new site. You are not bidding high enough to get exposure. The market is not yet ready for your product. You are marketing it from the wrong angle. Your landing page is not making a compelling offer. You are marketing it to the wrong people. We host a directory of free PPC coupons which advertisers can use when they open advertising accounts with Bing Ads, Google AdWords & other online ad networks. When opening up a PPC accounts, many people are hesitant to spend a lot of money. In spending a small amount, the business is essentially ignoring the feedback loops search engines have set up. Is it better to lose $100 today, or to lose it over three months and finally come to the conclusion that you need to change? I would rather want to know that I need to change now. Not all industries or business models will make money from AdWords. If you spend on targeted keywords, your site should have a chance for success. Any marketed, Internet-based business should leverage fast feedback loops to help it improve. Off the start, you want to overspend on your ads so you can see which ones are effective. After awhile, you can regroup your ads by price, and then slash your bid price. The ineffective ad groups or keywords will be disabled due to quality-based minimum bids and the winners will keep displaying. If you are an affiliate, lead generation may be a smarter way to dive into Google AdWords than trying to sell affiliate products. Since it is common to have a lead generation rate of 10-20%, the feedback loop is about ten times as fast as selling a product that may convert at a much lower 1-2%. If you run a business selling high end services it is better to send traffic to a trust building offer rather than a sales letter. There are a few major players in the pay-per-click arena. Google AdWords has a larger distribution network across Google, AOL, Ask, About, Earthlink, and many others' sites (even a few of my own). Yahoo! Search Marketing currently has network partnerships that span Yahoo, InfoSpace, AltaVista, AllTheWeb, and many other partners. Microsoft adCenter is a new player in the market, but their limited syndication network means their traffic quality is high. When beginning pay-per-click advertising, I would recommend focusing on Google AdWords, Yahoo! Search Marketing, and Microsoft adCenter. I also published an article mentioning some of the other networks, but they are not recommended off the start due to dirtier traffic sources and slower market feedback. PPC search engines provide a highly trackable marketing medium. Frequently, people begin marketing without any idea as to the approximate value of a click. If you do not set up a value range and track the results, you have no way to distinguish good marketing from bad marketing. To know the value of a click, you need to decide what the goal of your marketing is. If you are just branding, then you should expect to lose money to gain mindshare or reinforce your brand, and tracking direct results may not be as important a goal. If you are using pay-per-click search engines for direct product marketing, you need to know how much each click is worth. Lead generation sites typically have a conversion rate around 10% to 12%, but can go as high as 30%+ if they are properly targeted and exceptionally appealing to visitors. Since little investment is needed to arrive at your website, and many other sites are just a click away, selling stuff on the web has a conversion rate similar to direct mail advertising. High ticket items have a lower conversion rate and unique, cheap items tend to have higher conversion rates. Many stores find typical conversion rates might be anywhere from .3 to 5%. There are many factors that go into click price. It is somewhat hard to measure branding, but ad distribution can help build brand awareness. Most other things outside of branding are tangible. If you know your average order size, profit per order, and estimated conversion rate, you can get a good idea what clicks are worth. Yahoo! Search Marketing offers a free return on investment estimation calculator, where you can plug in different scenarios to estimate how much you can afford to pay per click. Some people also factor in lifetime value of a customer, but that is harder to measure, and there is still enough opportunity in many markets to do your math primarily based on direct return. It is a good idea to look at the various ads that are displayed and in which order over time. The top guy might be an idiot losing tons of money or a person who is paying a premium for branding. If ads from affiliate marketers or smaller sites are ranking around the same ad position over the course of a few weeks to a month, then they are probably doing something right (generating profits). It is worth it to take a couple weeks to do deep keyword research and market analysis before jumping into pay-per-click search engine marketing. You need to learn how the systems work. You are competing against the best accounts. Some competing advertisers may have other intangible assets that give them an unfair advantage. If you are brand new, your competitors have more experience than you do. Some ad campaigns have been fine tuned for months. Search engines are building trust factors into ad accounts. Some advertisers may get quality boosts and cheaper ads just for being long-term advertisers, or for advertising trusted websites. Search engines try to sell the concept of pay-per-click marketing saying that it is so targeted that everyone makes money, but in the real world, that is not how things work. Some markets are competitive and will require learning, practice, sound strategy, and tracking to generate profits. I was working to raise the rankings of one client for a few competitive phrases. It was taking a decent investment in time and money. I then started a pay-per-click campaign to test numerous terms. As it turns out, the conversion rate for the words we thought we needed were not great. There were a couple other terms with lower search frequency and less competition that converted exceptionally well. 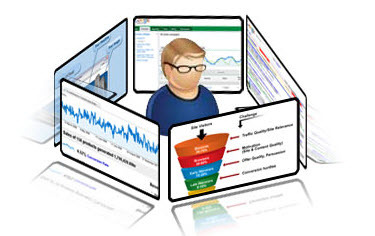 Had we not done pay-per-click marketing, we may have never properly focused our SEO efforts. In less than a month, on about $300, we increased the productivity of the site tenfold. The only way to be certain of anything in marketing is to test it. Pay-per-click marketing allows you to test in real time with the fastest feedback loop of any marketing medium in the world. The more expensive the associated PPC ads are, the more value there is in performing SEO on a site in a paid niche. If the average cost-per-click is $5, then a $1,000 SEO campaign pays for itself after only a few hundred targeted visitors. Yahoo and Microsoft tend to be a bit sloppier than Google at monetizing niche advertisements. Google has a larger advertiser base and props up the ad costs using something they call quality based minimum bids. If you are unsure whether an SEO campaign would justify its fees, you can run a test PPC account to see what type of demand there is in your target market. If a term does not convert well for you, then it may not be worth it to rank near the top for that term. Back when Yahoo! still shared bid prices (they no longer do) a person was bidding for an eBay affiliate ad for the keyword SEO Book at over $1 a click. Assuming I can get a 1.5% conversion rate, I can afford to pay that much, but this person was just throwing away their money. Just to test the waters, I placed my e-book on eBay, and it did not go for anywhere near what I usually sell them for. I find it hard to believe the person who was bidding a dollar a click was making any money. They later lowered that bid to 21 cents. In some markets, there will be dumb companies that rotate in, lose money, and then go bankrupt. By the time they go bankrupt, others may soon take their money-wasting market position. Want to Join the #1 SEO Training Course? Subscribe today to gain immediate access. the top ranked online SEO training program, which includes over 100 training modules, has been well referenced around the world, & is currently being used as course material for accredited college courses in internet marketing. the leading SEO community forums where you can interact directly with some of the sharpest minds in search & get your questions answered. I've been a paying member since day one. It's been the best $2000 I've ever spent on SEO, SEM, Social Media and general business information. Want to learn more? Check out the member tour.